It had been years since I had been to Spitalfields Market, in particular Old Spitalfields Market, and so one lunch time I was pleased to be invited down to try some of the food available there. I arrived and saw a really lovely area called The Kitchens at Old Spitalfields Market where there is a handpicked collection of ten traders with a blend of of contemporary dishes to try. This initiative is championed by Nuno Mendes, who owns restaurant Taberna do Mercado on the edge of the market. This project is part of Ten Ten, a creative organisation headed by him and hospitality consultant Stephen Macintosh. As I walked around The Kitchens contemplating what to eat for lunch my nose was drawn to John Li and Yee Li’s Dumpling Shack. I saw Wontons and suddenly that is all I wanted to devour. I chose the Prawn Wontons in Sichuan Chilli Oil as I am rather obsessed with the numbing effect that Sichuan Chilli brings on, an addiction I obtained on my trip to Hong Kong. 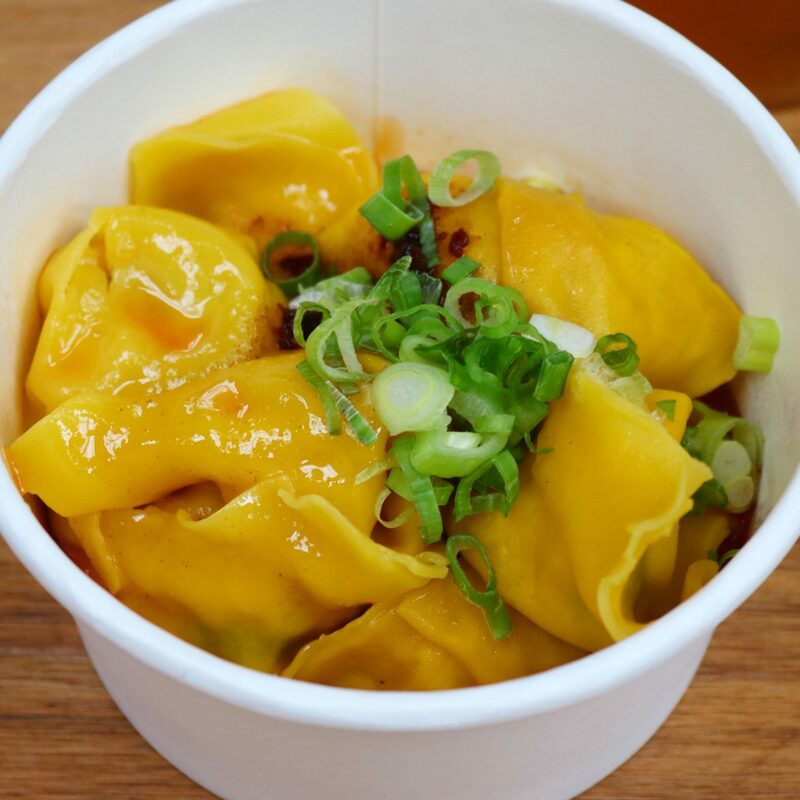 I can’t even give these wontons justice in words but trust me they were absolutely incredible and I know I will definitely be back to sample some more from Dumpling Shack. To refresh and hydrate myself I sipped on an iced tea from High Mood Food, which is a new health food concept with a unique focus on fermentation. It was absolutely delicious. I then pondered what to try next and settled on a Steamed Roast Pork Belly bun with kakuni sauce, cucumber and spring onion from Yum Bun. The pork belly was cooked to perfection and all the flavours caused an epic taste explosion in my mouth. It was also a generous size and by this point my stomach was full! I really enjoyed my lunch and am rather envious of people who work nearby who can pop in to get something super tasty for their meal! There were other stalls which I will definitely be trying next time including Bleecker Burger, Merkamo for Ethiopian food, Berber and Q and Laphet. I might drag a friend so we can try more of everything! It is open 7 days a week so a great place to try on the weekend too. There are ample seats around to enjoy your food on, as well as a bar where you can take food brought from Old Spitalfields into. I was a guest of Old Spitalfields Market but all views are my own. This food looks so tasty!! I love this kind of street food! It looks delicious!